The insider advice on this page is from one of Wendy’s Trusted Travel Experts for Oman: Jonny Bealby. “Beaten paths” are few and far between on Jonny’s trips. 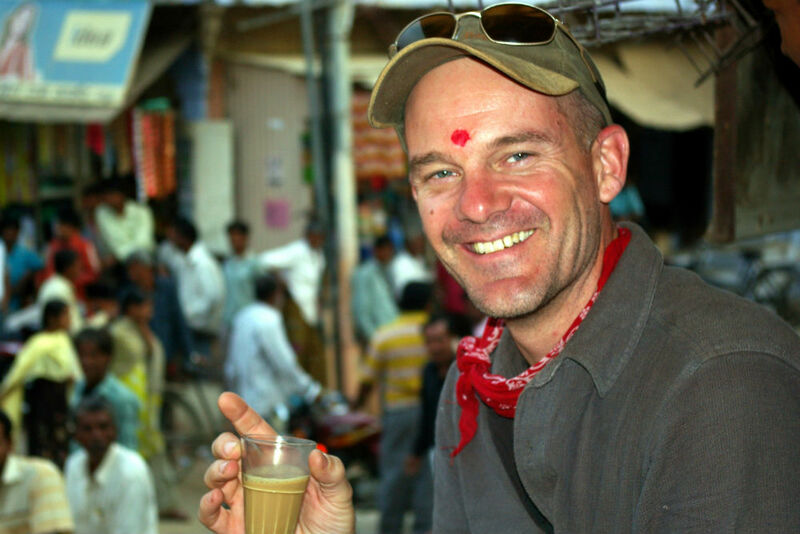 Based in the U.K., but with decades of adventures in the Middle East and Central Asia under his belt, Jonny has even written books about his epic journeys, including through war-torn Afghanistan and by horse along the Silk Road to the Caspian Sea. 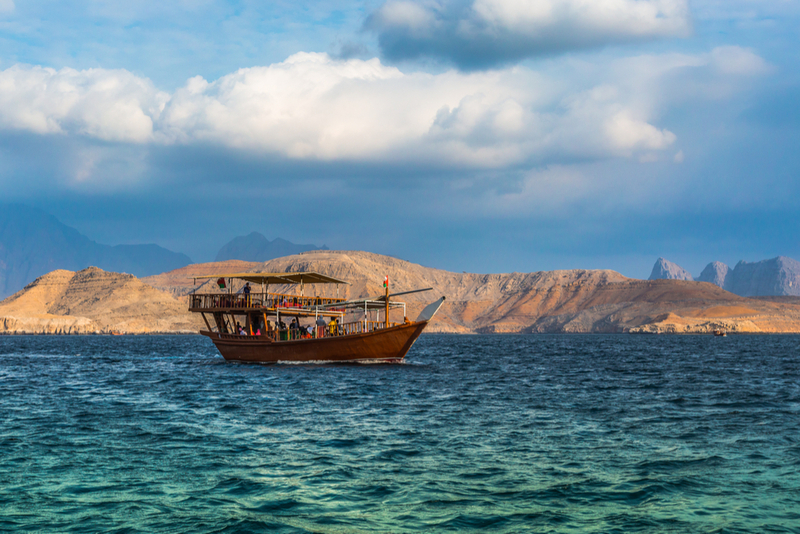 He and trusted deputies Nigel Fisher and Dan Waters—who have also traveled extensively in the Middle East and Asia—want to get you under the skin of the world’s exotic frontiers, while of course ensuring your safety throughout. 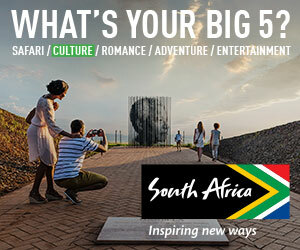 They are eager to immerse you in the local culture via overnights in village homes or desert camps, but are also well-acquainted with the most magnificent five-star properties. Whatever your preferred nightly accommodations, Jonny, Nigel, and Dan will ensure you spend your days authentically: In Oman, they’ll get you to the tallest dunes in the Empty Quarter at sunset. In Jordan, they’ll introduce you to semi-nomadic families of shepherds and their goats. In Iran, they’ll get you into the closed-to-the-public Tehran Museum of Contemporary Art so you can see one of the world’s most impressive collections of modern art—we’re talking Pollocks, Manets, Gauguins—in the most surprising of places. Trips have a 5-night minimum and start at $700 per day for two travelers. The Ras Al Jinz Turtle Reserve does good work, and they go to great lengths not to disturb the turtles during their critical nesting time. However, the sanctuary gets very busy—and peak nesting season does not coincide with peak tourist season—so you can end up with a lot of people looking at not very many turtles. The Empty Quarter of Oman. 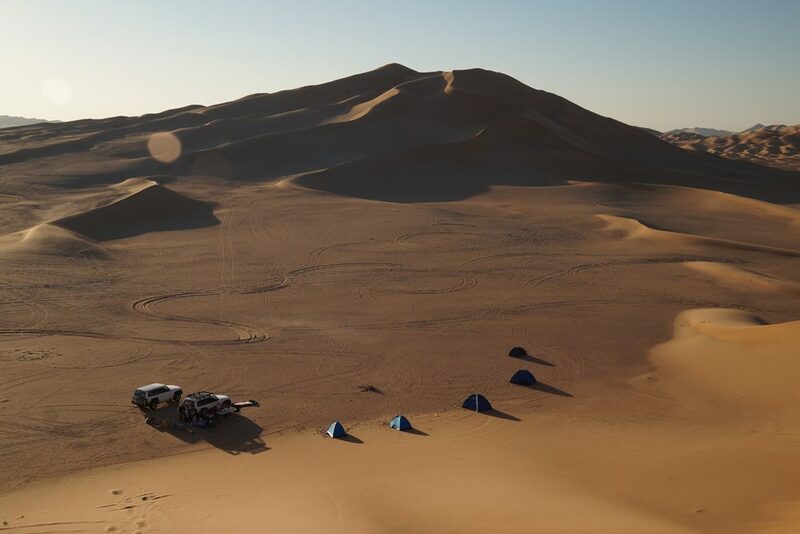 A night or two spent among the dunes of this vast desert will blow your mind. Out here you can visit a camel farm in the morning, enjoy a picnic lunch at an oasis for a respite from the midday heat, and watch the sunset from the top of the endless dunes. Depending on your budget, we can put you up in either basic dome tents or a luxurious Bedouin-style encampment with raised beds and bathroom facilities. Either way, you’ll enjoy the dramatic solitude of a sand sea extending to the horizon in every direction. Misfah village. This small, crumbling, old town is wonderfully atmospheric, set among the hills and inaccessible to vehicles. The village is colored with flowers, and crops are made possible by a falaj—an ancient irrigation system that not only brings life to the village but also serves as its hypnotic sound track. One of my favorite places in Oman is Wadi Bani Khalid. If I wanted to escape the world for a day, this is where I would go. It’s an absolutely picture-perfect oasis. You walk through a canyon, past a small area of crops and the ubiquitous falaj water systems, and then suddenly you are greeted by the most magnificent set of palm-fringed, crystal-clear swimming holes. If you’re feeling adventurous, you can swim up the river and do a bit of easy canyoning, going up small waterfalls and scrambling over rocks to reach various pools. The edge of Wadi Ghul, Oman’s Grand Canyon. Enjoy epic views over some very dramatic scenery. 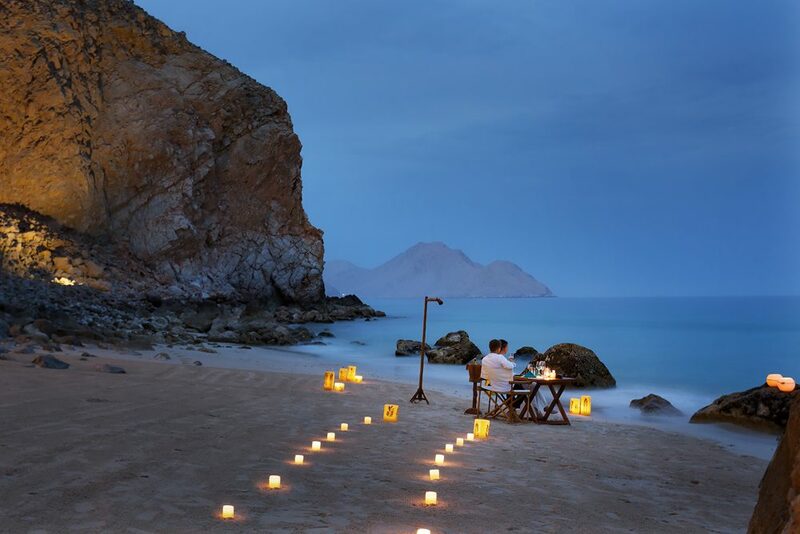 The Six Senses Zighy Bay. 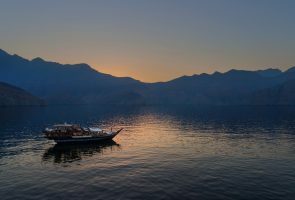 It’s got a stunning location on a pristine bay on the Musandam Peninsula, resplendent with soft white sand and crystal-clear blue waters, with surrounding hills providing a magical backdrop. There are numerous pools and a wonderful spa. The huge beach villas are luxe but rustic; each has a private plunge pool and numerous lounging areas both indoors and out. My favorites are the beachfront pool villas, whose palm-leaf gates allow direct access onto the beach and uninterrupted views of the Gulf of Oman. 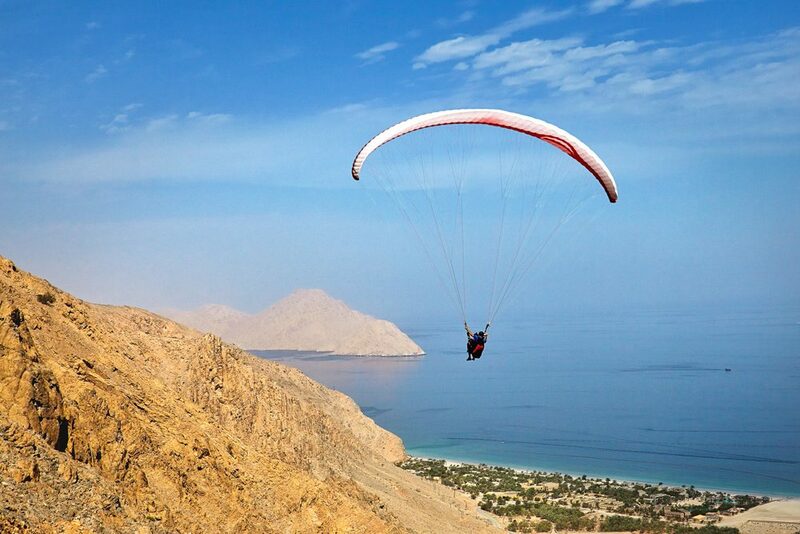 We can even arrange for you to arrive via paraglider (with your luggage coming separately and a pilot guiding you down, of course). The Beach Restaurant at The Chedi hotel in Muscat: world-class food and wine, including stunningly fresh seafood, served with a backdrop of the beach and the Gulf of Oman lit up by fire pits. Shuwaa, the national dish of Oman, is always served at any decent celebration. It is utterly delicious and reflects Oman’s historical importance along the Far Eastern spice routes. Making a shuwaa is a time-consuming event: First, you liberally spice a joint of lamb with cloves, coriander, cardamom, cumin, pepper, or other spices. The joint is then wrapped in banana leaves and slow-cooked underground over hot coals for at least 24 hours. When it comes out, it is some of the most flavorful, melt-in-your-mouth meat you’ll ever eat. Shuwaa is normally served with rice, shared among many, and eaten with your hands Omani-style. You’ll find shuwaa everywhere from fancy restaurants to small local places; a good in-between is Kargeen Restaurant in Muscat, which has a really nice courtyard and serves the dish in single portions. March through May and Mid-September through October, when it’s not too hot in the desert and not too chilly in the mountains. July and August, when the temperature regularly exceeds 110 degrees. Not all hotels are licensed to serve alcohol; if you like a gin-and-tonic at sunset, stock up at the duty-free. 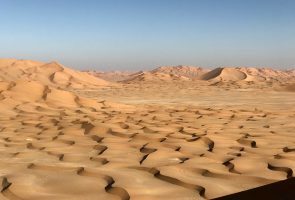 In the Empty Quarter, climb to the top of one of the world’s highest dunes at sunset, and you’ll have the perfect shot: Just you amid unending desert! Frankincense. Southern Oman has been growing and trading this fine-smelling resin for millennia. The best place to buy it is in the Salalah souq. When arranging a taxi in Muscat, check with your hotel or guide first to establish how much you should be paying and agree with the driver beforehand; otherwise, you may be stung by an inflated fare. On public beaches, both men and women should swim with their tops covered if there are local Omanis around. So if you intend to swim in public places, pack a rash guard or other shirt for swimming. No one will ever tell you off, but it’s about being respectful of the local culture. At private pools and beaches, you are free to wear what you want.